My usual wiring "natural habitat" has been industrial/commercial settings. In fact, for over 25 years, I've been an IME. But, I occasionally hack my way through the residential jungle. Obviously, I'm the chief (and only) electrician in my own home. In fact, a few years back I was able to put my skills to work when we renovated our flat roof carport, morphing it into a laundry room, sewing room, and my personal office. While electrifying those three areas, I also took the time to rewire the rest of the house, bringing the old shack up to current Code regulations. There are newer products and innovations I wish were around back then. Could have saved some time... and money. But fortunately, many make good retrofits as well. Here are some new ideas. One can never have too many power outlets, can one? Whenever I need to plug something in, it seems there never a receptacle available where I need it. Or if there is, it's already full or blocked. Take the kitchen counter, for example. Often, it's lined with small appliances or other sundries. And something needs to be moved before the outlet appears. But new under-the-counter options put receptacles conveniently within reach, yet don't interfere with the look and feel of the décor. For under the counter (or under the upper cabinets) an angled box puts the receptacle out of the way, yet readily available. On top of the counter, pop up boxes keep the receptacles hidden when not in use. But with a quick push, the power is instantly available for that slow cooker, hot plate or coffee pot. And yes... the best ones are spill resistant. Here's one I'll probably add in the near future. It's a receptacle box that mounts flush on top of a desk via cutout. It pops into use when needed. Supplied with a mounted extension cord, I can simply plug it into the hard to reach receptacle behind my desk. No more aching back from stumbling under my computer desk to plug in an accessory! And don't forget the floor! Floor boxes, like those found in commercial settings, can be easily installed in living rooms or dens, providing instant power when needed. Concrete slab (new construction) and wooden floor models are available. Back in the day, all we had for communications was a wall-mounted telephone. Remember those? But in today's modern home, all types of communications equipment surround us. If possible, locating the "home base" for all this stuff in a closet or single room is best. Just like your breaker box keeps your power together, similar boxes work for communications. 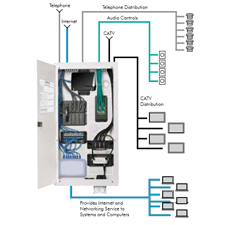 Internet, data, voice and entertainment cabling can originate from one panel box, keeping it neat and tidy. From there, cabling is run overhead and through the walls, giving your communications network a clean, professional look. Once it's located at the business end of your cable, multipurpose outlet boxes terminate any service in one spot behind desk, TV or computer. With the newest wiring devices—and a little thoughtful planning—a home wiring install can look just as professional as any commercial setting.